BAT, one of the world’s leading cigarette manufacturers, is fighting through the courts to try to block the Kenyan and Ugandan governments’ attempts to bring in regulations to limit the harm caused by smoking. The giant tobacco firms hope to boost their markets in Africa, which has a fast-growing young and increasingly prosperous population. In one undisclosed court document in Kenya, seen by the Guardian, BAT’s lawyers demand the country’s high court “quash in its entirety” a package of anti-smoking regulations and rails against what it calls a “capricious” tax plan. The case is now before the supreme court after BAT Kenya lost in the high court and the appeal court. A ruling is expected as early as next month. BAT in Uganda asserts in another document that the government’s Tobacco Control Act is “inconsistent with and in contravention of the constitution”. Later this month, BAT is expected to become the world’s biggest listed tobacco firm as it completes its acquisition of the large US tobacco company Reynolds in a $49bn deal, and there are fears over the extent to which big tobacco can financially outmuscle health ministries in poorer nations. A vote on the deal by shareholders of both firms is due to take place next Wednesday, simultaneously in London at BAT and North Carolina at Reynolds. Experts say Africa and southern Asia are urgent new battlegrounds in the global fight against smoking because of demographics and rising prosperity. Despite declining smoking and more controls in some richer countries, it still kills more than seven million people globally every year, according to the WHO, and there are fears the tactics of big tobacco will effectively succeed in “exporting the death and harm” to poorer nations. In Kenya, BAT has succeeded in delaying regulations to restrict the promotion and sale of cigarettes for 15 years, fighting through every level of the legal system. In February it launched a case in the supreme court that has already halted the imposition of tobacco controls until probably after the country’s general election in August, which are being contested by parliamentarians who have been linked to payments by the multinational company. The court actions are brought by BAT’s local affiliates, BAT Kenya and BAT Uganda, but approved at Globe House, the London headquarters of the multinational, which receives most of the profits from the African trade. In its 2016 annual report, BAT outlined the “risk” that “unreasonable litigation” would be brought in to control tobacco around the world. Its response was an “engagement and litigation strategy coordinated and aligned across the Group”. At its annual meeting in March, chairman Richard Burrows toasted a “vintage year” for BAT, as profits rose 4% to £5.2bn after investors took their cut – their dividend had increased by 10%. When asked about the legal actions in Africa, he said tobacco was an industry that “should be regulated … but we want to see that regulation is serving the correct interests of the health mission and human mission which should lie behind it”. So, “from time to time it’s necessary for us to take legal action to challenge new regulation” which he said was led by “the local board”. BAT says it is “simply not true that we oppose all tobacco regulation, particularly in developing countries”. Tobacco should be appropriately regulated as a product that has risks to health, it said, but “where there are different interpretations of whether regulations comply with the law, we think it is entirely reasonable to ask the courts to assist in resolving it”. It was opposed to only a handful of the issues in Kenya’s regulations, not the entirety, it said in a statement. 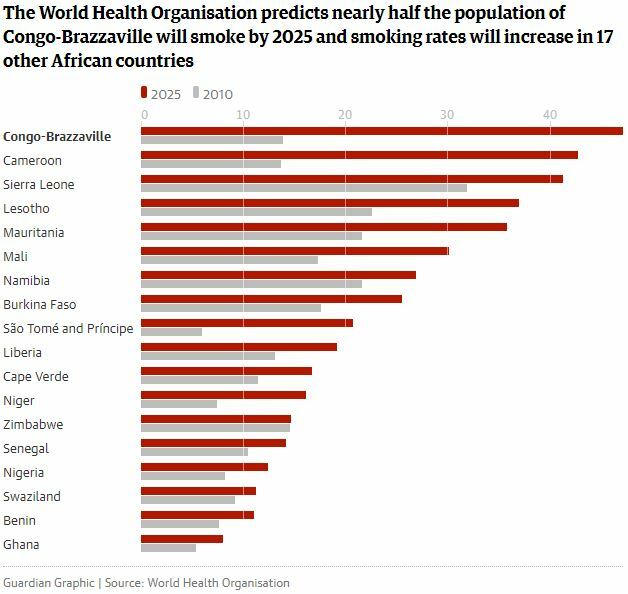 The WHO predicts that by 2025, smoking rates will go up in 17 of the 30 Africa-region countries from their 2010 level. In some countries a massive hike is expected – in Congo-Brazzaville, from 13.9% to nearly half the population (47.1%) and in Cameroon from 13.7% to 42.7%. In Sierra Leone it will be 41.2% (74% among men) and in Lesotho 36.9%. In contrast, research showed last year that just 16.9% of adults smoke in the UK; and last month new figures showed UK heart disease deaths had fallen 20% since that country’s indoor smoking ban. “The tobacco industry is now turning its focus toward emerging markets in sub-Saharan Africa, seeking to exploit the continent’s patchwork tobacco control regulations and limited resources to combat industry marketing advances,” said Dr Emmanuela Gakidou and colleagues at the Institute for Health Metrics and Evaluation at the University of Washington in Seattle, publishing an analysis of smoking prevalence around the world in the Lancet in April. Africa’s growing numbers of children and young people, and its increasing wealth, represent a huge future market for the tobacco industry. The companies deny targeting children and cannot sell packs smaller than 10, but a new study carried out in Nairobi by the Johns Hopkins school of public health in the US and the Kenya-based Consumer Information Network found vendors selling cigarettes along the routes children take to walk to primary schools. BAT said that its products were for adult smokers only and that it would much prefer that stalls sold whole packets rather than single sticks, “given our investment in the brands and the fact there are clear health warnings on the packs. Concerns have been raised about links between politicians and the tobacco companies. “There are allegations of some of them having been bribed in the past,” said Joel Gitali, chief executive of the Kenya Tobacco Control Alliance. Tih Ntiabang, regional coordinator for Africa of the Framework Convention Alliance – NGOs that support the WHO treaty – said the tobacco companies had become bolder. “In the past it used to be invisible interference, but today it is so shameful that it is so visible and they are openly opposing public health treaties like the case in Kenya at the moment … Today they boldly go to court to oppose public health policy. Every single government is highly interested in economic growth. They [the tobacco companies] know they have this economic power. The budget of tobacco companies like BAT could be as much as the whole budget of the Africa region. The sale across the whole of Africa of single cigarette sticks was a serious problem because it enabled children to buy them. “They are extremely affordable. Young teenagers are able to purchase a cigarette. You don’t need £1 for a pack of 20,” he said. In Uganda in 2014, BAT managing director, Jonathan D’Souza, sent a 13-page detailed attack on the tobacco control bill, then going through parliament, to the chair of the government’s health committee. BAT was contracting with 18,000 farmers and paid them 61bn Ugandan shillings for 16.8m kg of tobacco in 2013, said the letter. The economy has “benefited significantly” from BAT Uganda’s investments, it said. “This has helped to alleviate poverty and improve welfare in urban and rural areas,” it says. BAT Uganda (BATU) agreed tobacco should be regulated while “respecting the informed choices and rights of adults who choose to smoke and the legal rights of a legal industry”. But it cited 11 “areas of concern”, claiming there is no evidence to support a ban on tobacco displays in shops, that large graphic health warnings on packs are ineffective, that proposals on bans on smoking in public places were too broad and that prohibiting smoking under the age of 21 was unreasonable, since at 18 young people are adults and can make up their own mind. Documents made public by the University of Bath show that BATU had another concern: the ban on the sale of cheap single cigarettes. Adults should be “free to purchase what they can afford”, says an internal leaked paper. BATU also took action against the MP who sponsored the bill. A letter informed him that the company would no longer be contracting with the 709 tobacco farmers in his region. There is evidence that the company also lobbied other MPs with tobacco farmers in their constituencies. The Tobacco Control Act became law in 2015, and in November last year, BAT sued. Many people choose to smoke, said an affidavit to the court from managing director Dadson Mwaura and it was important to ensure regulation did not lead to “unintended consequences that risk an untaxed and unrestrained illegitimate trade in tobacco products”. BATU’s legal product contributed to the Ugandan economy “in many dimensions”. Democratic Republic of Congo: Letter to the president sent in April 2017 by the Fédération des Entreprises du Congo (chamber of commerce) on behalf of the tobacco industry, listing 29 concerns with the proposed tobacco control regulations, which they claim violate the constitution, international agreements and domestic law. Ethiopia: Letter sent in February 2015 to the ministers of health and science and technology by Philip Morris International, claiming that the government’s tobacco directive banning trademarks, brands and added ingredients to tobacco breached existing laws and would penalise all consumer retailers. Togo: Letter to the minister of commerce in June 2012 from Philip Morris International opposing plain packaging, which “risks having damaging consequences on Togo’s economy and business environment”. Namibia: Letter to the minister of health from BAT, warning that planned tobacco controls will have “a massive impact … on the Namibian economy at large”. Bintou Camara, director of Africa programs at Campaign for Tobacco-Free Kids, said: “British American Tobacco, Philip Morris International and other multinational tobacco companies have set their sights on Africa as a ‘growth market’ for their deadly products”. Throughout Africa, tobacco companies have tried to intimidate countries from taking effective action to reduce tobacco use, the world’s leading cause of preventable death, he added. Philip Morris said it is regularly engaged in discussions with governments. “We are approached by or approach public authorities to discuss a range of issues that are important for them and for us, such as taxation, international trade, and tobacco control policies. Participating in discussions and sharing points of view is a basic principle of public policy making and does not stop governments from taking decisions and enacting the laws they deem best.” It said that it supports effective regulation, “including laws banning sales to minors, mandatory health warnings, and advertising restrictions”. Imperial Tobacco said it sold its brands “where there’s a legitimate and existing demand for tobacco and take the same responsible approach in Africa as we do in any Western territory”. A spokesman said it supported “reasonable, proportionate and evidence-based regulation of tobacco”, including “health warnings that are consistent with global public health messages”. But, it said, Imperial would “continue to make our views known on excessive, unnecessary and often counter-productive regulatory proposals”. The trend to reduce smoking and cancer rates by forcing tobacco companies to use plain packaging is gaining momentum across the globe, concludes an international report released today by the Canadian Cancer Society. The report shows that 4 countries have plain packaging laws in place and 14 others are working on it. Plain packaging requirements prevent tobacco companies from using colours, logos and design elements to market their cancer-causing products. The shape of the package must be in a standardized format, outlawing sales tactics such as slim packs appealing to girls and young women. Health warnings still appear on plain packages. In 2001 Canada was the first country in the world to implement graphic picture warnings on cigarette packages. Since then, more than 100 countries and territories (105 in total) have followed Canada’s lead – accounting for 58% of the world’s population – as illustrated in this graph. Canada’s leadership in graphic picture warnings has resulted in enormous health benefits globally. Smoking is the leading cause of preventable disease and death in Canada, including about 30% of all cancer deaths and 85% of lung cancer cases. Tobacco kills 37,000 Canadians every year. Tobacco packaging is one of the last and most effective ways for companies to promote their products, with eye-catching logos and colours designed to appeal to consumers. Plain packaging reduces tobacco use by eliminating promotion on packaging, reducing product appeal, curbing package deception, and increasing the impact of health warnings. Research shows that plain packaging works. Plain packaging is required in Australia, the United Kingdom and France, and will be by 2018 in Hungary. The 14 countries working on plain packaging are Canada, New Zealand, Ireland, Norway, Slovenia, Uruguay, Thailand, Singapore, Belgium, Romania, Turkey, Finland, Chile and South Africa. Canada’s federal government included a commitment to plain packaging as part of its 2015 election platform. After forming a government, Prime Minister Justin Trudeau identified it as a “top priority” in a mandate letter to Health Minister Jane Philpott. On May 31, 2016 – World No Tobacco Day – Minister Philpott launched a 3-month public consultation on plain packaging. The federal government is now reviewing the responses and developing regulations. The Canadian Cancer Society report released today – Cigarette Package Health Warnings: International Status Report – ranks 205 countries and territories based on the size of their health warnings on cigarette packages and lists countries that have finalized requirements for picture warnings. Canada ties for 8th in the world with package warnings that cover 75% of the package’s front and back. Nepal and Vanuatu are tied for top spot with a warning size of 90%, while India and Thailand are 3rd at 85%. The United States is in last place with minimal requirements for health warnings on either the front or back of the package. The Canadian Cancer Society is calling for plain packaging to be implemented in Canada as part of a strengthened Federal Tobacco Control Strategy, which should also include increased funding to support additional programming and policy measures. Health Canada’s current strategy expires on March 31, 2018. The existing Tobacco Act is 2 decades old and must be modernized. The Society’s report, published every 2 years, reviews and ranks cigarette health warnings internationally and tracks developments in this important area of tobacco control. The Canadian Cancer Society’s report was released today in Delhi, India, at the 7th session of the Conference of the Parties to the WHO Framework Convention on Tobacco Control being held Nov. 7-12. The report was released to support implementation of the WHO Framework Convention on Tobacco Control, ratified by 180 countries. The goal of this international treaty is to control the global tobacco epidemic. Its guidelines recommend that parties consider implementing plain packaging. About the Canadian Cancer SocietyThe Society is a national, community-based organization of volunteers whose mission is to eradicate cancer and enhance the quality of life of people living with cancer. Thanks to our donors and volunteers, the Society has the most impact, against the most cancers, in the most communities in Canada. For more information, visit cancer.ca or call our toll-free bilingual Cancer Information Service at 1-888-939-3333 (TTY 1-866-786-3934). Eighteen months after the launch of a global campaign to persuade money managers to black-list tobacco stocks, just one major European investor has answered the rallying cry. Others are largely sticking with an industry that remains lucrative despite tightening restrictions on smoking and a series of lawsuits in the United States, saying they are duty-bound to seek the best returns for their clients. Even a United Nations-backed treaty which aims to cut tobacco consumption by almost a third within 10 years is failing to deter many investors in the likes of Philip Morris International (PM.N), British American Tobacco (BATS.L), Japan Tobacco (2914.T) and Imperial Brands (IMB.L). “We are firmly of the view that profits, cash and dividends from tobacco stocks have many years of strong growth ahead,” said Stephen Lamacraft, fund manager at Woodford Investment Management. Still, the Global Taskforce for Tobacco Free Portfolios, backed by the Union for International Cancer Control, has scored one big victory since it began campaigning in March 2015 for financial institutions and pension funds to divest an estimated $60 billion from the industry. In May this year, French insurer and fund manager Axa agreed to ditch its tobacco holdings, becoming the first major European investor to sign up to the campaign, although others had already opted out of tobacco before it was launched. Axa said its role as a health insurer meant it could no longer justify investing in something that had such a “tragic” impact on public health. At the time it held 200 million euros in tobacco stocks and about 1.6 billion euros ($1.8 billion) in bonds issued by the cigarette makers. Even then, the process is lengthy. Axa has almost completed selling the shares but will keep the bonds until they mature. Only in 2027 will the bulk – 97 percent – be off its books. Many other investors appear reluctant to discuss the issue. Reuters contacted 24 large fund managers which hold tobacco stocks, and all but seven declined comment or did not respond. According to the World Health Organization (WHO), tobacco kills around 6 million people each year, including 600,000 non-smokers exposed to second-hand smoke. Many of the passive victims are children. The Taskforce’s global Project Manager, Melbourne-based Bronwyn King, has persuaded more than 30 Australian superannuation funds to ditch tobacco but the campaign faces a tougher challenge in Europe. The same goes for the United States, where one influential investor, the California Public Employees’ Retirement System is reviewing a 16-year investment ban on tobacco after a study estimated the policy had cost it $2 billion to $3 billion in returns. Campaigners reject the fiduciary duty argument – that funds must seek the best returns for their clients. They note that about 180 countries have signed up to the WHO’s Framework Convention on Tobacco Control, which aims to cut consumption by 30 percent by 2025 through new regulations and tax increases that will make tobacco less affordable. Currently just a handful of countries fully comply with the treaty, implying a significant future hit to the value of tobacco stocks when others follow suit. “Over the longer term, (the treaty) has to decrease the validity of the product – you will have fewer people wanting or being able to buy tobacco and that has to impact the investment appeal of the producers,” said Rachel Melsom, UK director of campaign group Tobacco Free Portfolios. Philip Morris International, Imperial Brands and BAT declined to comment. Japan Tobacco did not immediately respond to a request for comment. The tobacco industry sells about 5.6 trillion cigarettes a year to the world’s 1 billion smokers, many of whom live in low and middle-income countries. Here consumption is expected to keep rising due to growing populations and income. More people are quitting smoking or cutting down in developed countries, but overall revenue and profit margins are consistently buoyed by companies’ ability to raise prices. International players have also largely shielded themselves from direct exposure to the U.S. market, which has a history of litigation against big tobacco companies. For instance, Philip Morris has been separated from Altria (MO.N), which sells its Marlboro cigarettes in the United States. In the 10 years to 2015 – a period that included the crisis of 2008-09 – the MSCI World Tobacco Index rose 10.4 percent compared with just 2.64 percent on the MSCI World Index. All this appeals to many fund managers. For instance, the 9.2 billion pound ($12.3 billion) CF Woodford Equity Income Fund managed by veteran fund manager Neil Woodford holds BAT and Imperial Brands – makers of the Lucky Strike and Gauloises brands respectively – among its top 10 positions. “(Tobacco’s) dependable dividends are increasingly highly-prized and still represent attractive yields,” said Lamacraft. The dividend argument doesn’t always hold water. London-listed British American and Imperial reported dividend yields of 3.2 percent and 3.78 percent respectively, compared with an average 4.06 percent across the FTSE 100 index. New-York listed Philip Morris International has a 4.01 percent dividend yield. Louise Dudley, portfolio manager at Hermes Investment, said she has barred tobacco stocks because she believes returns are unsustainable in the long-term. A spokeswoman for Standard Life Investments (SLI) said its decision not to black-list tobacco reflected the needs and views of its clients. But Melsom said ordinary savers didn’t always know where their money was being invested. “If every individual who has a pension fund could see their level of investment in tobacco and the costs associated with that, I think that would make a difference,” she said. Client attitudes towards tobacco varied widely, according to Iain Richards, Head of Responsible Investment, EMEA, at Columbia Threadneedle Investments. “We are satisfied that, for our mainstream funds, our approach is measured, works well and serves our clients’ best interests. We therefore don’t intend to adopt a blanket divestment policy on tobacco,” he said. Amra Balic, Head of BlackRock’s EMEA Investment Stewardship team (BLK.N), said her firm did not make social, ethical or environmental values judgments on behalf of clients, and company engagement was critical in addressing the health and social risks of tobacco. “I don’t think that we will end up, by divestment, in a world where tobacco won’t exist, therefore engagement by responsible investors is key to holding companies to account on ESG (environmental, social and governance) issues”. A spokeswoman for M&G, another investor in the sector, said it regularly discussed environmental, social and ethical risks with tobacco company management, and encouraged improvements where it considered performance to be poor. SLI, BlackRock, M&G, Columbia Threadneedle, Handelsbanken and Aberdeen Asset Management all said clients could bypass tobacco with their socially responsible investment (SRI) funds. Handelsbanken said about 40 percent of the assets that it manages are in funds that exclude tobacco investments. The performance of SRI funds, which often also avoid industries such as armaments and alcohol, is typically benchmarked against indexes that exclude tobacco firms. But mainstream funds are benchmarked against indexes that usually include them. Any that chooses to drop tobacco stocks is likely to underperform its benchmark index, putting pressure on managers to stick with the status quo. “You need to benchmark against other funds that don’t include tobacco and see how you how perform in other investments you have put in its place,” Melsom said. JPMorgan Asset Management, Nordea Asset Management, Invesco Perpetual, Morgan Stanley Investment Management, Vanguard, Franklin Mutual, Capital Group, RBC, Legal & General Investment Management, Credit Suisse Private Banking, SEB Investment Management, Andra AP Fonden, Forsta AP Fonden, Oppenheimer Funds, Gabelli Funds, Capital Research and Reinet Investments. Despite a significant decline in overall adult cigarette smoking since 1964, disparities in cigarette smoking remain among racial and ethnic population groups, according to a new study from the Centers for Disease Control and Prevention (CDC) published in today’s Morbidity and Mortality Weekly Report (MMWR). For example, current (past 30-day) cigarette smoking during 2010-2013 was lower among Asians overall (10.9 percent) compared with Whites (24.9 percent). But among Asian sub-groups, the prevalence of current cigarette smoking ranged from 7.6 percent among Chinese and Asian Indians to 20.0 percent among Korean Americans. The American Indian/Alaska Native population had the highest prevalence of cigarette smoking at 38.9 percent. The findings in this study show the importance of identifying higher rates of tobacco use across and within racial/ethnic population groups to better understand and address differences in tobacco use among U.S. adults. Estimates of cigarette smoking prevalence are usually presented in aggregate for racial or ethnic populations, such as Asian or Hispanic, because sample sizes are too small to provide estimates among racial/ethnic subgroups within these populations. To get a large enough sample size for this study, researchers aggregated data from the National Survey on Drug Use and Health collected between 2002-2005 and 2010-2013 to assess cigarette-smoking prevalence among 6 racial and ethnic population groups and 10 select subgroups in the United States. Hong Kong’s women and men enjoy the longest life expectancy in the world, according to data released by Japan’s health and welfare ministry on Wednesday. The average lifespan for women in Hong Kong is 87.32 years, and local men on average can expect to live to 81.24. Japanese women took second place at 87.05, while Icelandic and Swiss men shared the second position in the men’s category at 81 years. The overall life expectancy gap between women and men fell by 0.07 year last year, compared with the previous year’s figures. Since 1985, Japanese womenhad the world’s longest average life expectancy. But this changed in 2011 when Hong Kong women overtook them after the catastrophic earthquake and tsunami in north-eastern Japan  in March that same year. Japanese women then regained the top spot in 2012 and managed to retain it for three consecutive years until last year. A Japanese health ministry spokesman said longer lifespans resulted from improved medical treatment and technology in beating diseases like cancer. Meanwhile, local health experts expressed little surprise over the findings for Hong Kong. University of Hong Kong public health professor Lam Tai-Hing said the city’s low smoking rates were the main reason for its life expectancy results. “Smoking in Hong Kong compared with 30 years ago has been reduced by half,” he said, adding that recent data showed 19 per cent of local men smoked and only 3 per cent of local women smoked. Lam noted that, when compared with Japan’s number of smokers – 30 per cent of men and 10 per cent of women – Hong Kong would continue to eclipse Japan in life expectancy rates in future. Michael Ni Yuxuan, a clinical assistant professor of public health at HKU, agreed with Lam. “Hong Kong has extremely low tobacco rates compared with the UK, US and Japan,” he said. Ni highlighted low infant and maternal mortality rates as another major factor. Department of Health figures showed infant mortality rates in the city dropped from 9.7 per 1,000 live births in 1981 to 1.3 per 1,000 last year. But Lam cautioned that differences between Hong Kong and Japan had to be taken into consideration. “Hong Kong is a city. Japan is a whole country,” he said, explaining that Japanese living in rural areas may have worse nutrition than Hongkongers as well as less accessibility to health care and education – factors in life expectancy. “In general, people in the city have longer lives, and people in Hong Kong have good access to education, clean water and electricity,” he added. The Financial Times reports that there’s been a fall of 2.4%, although the Chinese market remains enormous, accounting for 45 percent of all cigarette sales in the World. China’s Government has recently been proactive in enforcing smoking bans in municipal spaces, and has increased tobacco duty from 5% to 11%. Cigarette sales fell in the world’s largest tobacco market in 2015 for the first time in two decades, according to research by Euromonitor International. The country’s cigarette market lost some 60 billion sticks last year, Shane MacGuill, head of tobacco research at Euromonitor, said. He attributed the decline to wholesale tax hikes, increased government control on production and greater health awareness in some regions. “We do not see 2015 as a one off with the Chinese market now projected to lose about 5% of its volumes between 2015 and 2020,” MacGuill said. E-cigarettes have become ever more popular since they first appeared on the market in 2007, and regulators have struggled to keep up. There has been much debate about the advantages and risks of using them. Community pharmacy is playing a significant role in the way the debate plays out, because many sell e-cigarettes, yet others regard such sales as unethical. The number of people who smoke tobacco has already reduced considerably over recent decades. In 1972 51% of men and 41% of women smoked. By 2014, those figures had reduced to 21% of men and 16% of women. However, even these reduced percentages mean that there are still 8.7 million current smokers in the UK. According to the Royal College, the resulting direct cost to the NHS from smoking related illness is currently exceeds £2 billion each year. Taking into account other associated costs, such as social care and a decrease in economic productivity, the overall annual cost to the tax-payer is estimated to be approximately £14 billion. The Royal College has been involved in reviewing the effect of smoking for many years although, at first there was little enthusiasm at Government level for any real control over tobacco. The College published a report in 1962 identifying tobacco smoking as the main cause in the significant increase of cases of lung cancer, but, it was not until 1998 that a comprehensive tobacco control policy in the UK was published. Because approaches to reducing the number of smokers have not been wholly successful, together with the fact that nicotine, in itself, is not a highly dangerous drug (although the smoke which is inhaled when smoking tobacco is), has led the Royal College to conclude that the use of e-cigarettes is, on balance, beneficial. This approach is consistent with Public Health England’s research that “While vaping may not be 100% safe, most of the chemicals causing smoking-related disease are absent and the chemicals present pose limited danger. The views of Public Health England and the Royal College of Physicians will not mean that sales of e-cigarettes will be unregulated. Ministers in Wales attempted, unsuccessfully, to ban e-cigarettes from public spaces this year, and in the UK, the MHRA recently licensed e-Voke as the first e-cigarette to have a licence as a medicinal product, opening up the possibility of vaping on prescription. However, given the costs of obtaining the necessary licence – which the Royal College of Physicians puts at between £252,000 and £390,000 plus annual costs of up to £249,000, this is unlikely to be a particularly popular option, despite the credibility having a licence gives the product. For those e-cigarettes that do not have a licence, the EU Tobacco Directive will came into force on 20 May. This regulates the content of e-cigarettes and imposes labelling and leaflet requirements. E-cigarettes must not contain more than 20 mg nicotine per ml; there are restrictions on additives; child resistant packaging is mandatory; and information leaflets must include possible adverse effects, addictiveness and toxicity. E-cigarettes must also continue to comply with advertising codes enforced by the Advertising Standards Authority. Despite any residual disquiet about the long term effects of e-cigarettes, it looks as though they are here to stay, and this is reflected in the increasing number of pharmacies which are now selling them.